My driver's license was suspended today. Actually, it was suspended back in January, but the suspension didn't take effect until today. Won't bore you with the gory details, but it had nothing to do with my driving. So I've been researching the bus schedules here in Orange county .. and been impressed with their system. For example, they have a trip planner, which allows you to enter a point of origin and a destination, and the planner will spit out an itinerary, which you can sort in differents ways, such as » by fastest route, fewest transfers, or shortest walking distance. Impressive technology. I even placed a few calls today .. to ask questions about things I couldn't find on their web site, and had zero wait-time. Very pleasant people, too. Again » impressive customer support. Whoever runs that enterprise is doing a great job. Costs $1.50 each time you board a bus (any bus), including those at so-called 'transfers points'. So if your trip involves a transfer, that's $3. Day-pass costs $4. So if your trip will involve more than 2 boardings (which they normally do), best to purchase a day-pass. 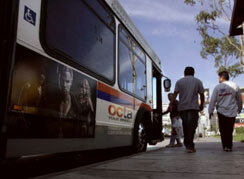 Continue reading Learning to Ride the Bus | OCTA.